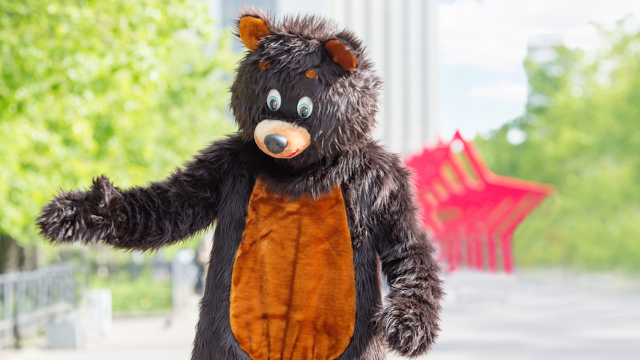 Bear mascot can't keep it together while filming local car dealership commercial. Commercials for local businesses are one of life's greatest, most hilarious joys. Is there anything better than a local car dealership commercial? Oh, right. Local car commercial outtakes, like these ones from White Bear Mitsubishi in Minnesota. The car dealership recently shared outtakes online from its latest commercial shoot, filmed at Mariucci Arena (home of the University of Minnesota hockey team). It features the dealership's general manager, Richard Herod III, Minnesota's Golden Gopher mascot, and the dealership's white bear mascot. The white bear is having just a little bit of trouble walking on the ice. I don't normally advocate laughing at the misfortunes of others, but, my God, that last bear fall is hilarious. Let's get this bear some skates next time, guys. Okay?